Whether you’re training for a marathon or need a new shoe for your morning jog, Nike has a fantastic range of running shoes to suit all types of runner. Our favourite Nike running shoe is currently the Nike Flyknit Lunar 2. 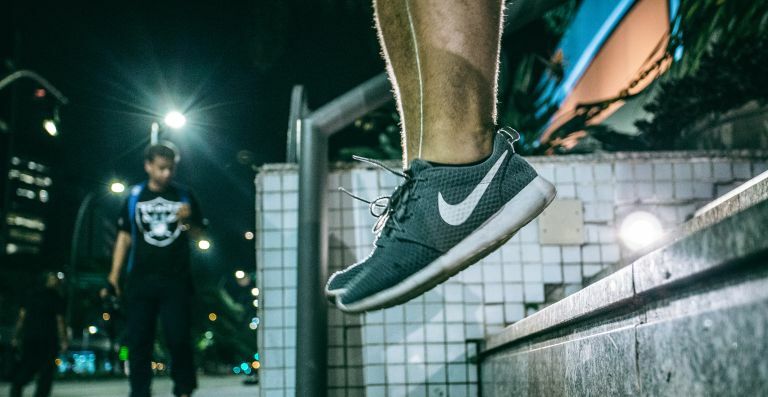 Picking the right shoe for you can be a daunting task, but with some key knowledge on your running style, foot structure and the different types of shoe Nike offer, you should be able to pick out a shoe that’s perfect for you in every way. First of all think about where you will be running. If you run on the road, you’ll want something with a lot of cushioning to take the pressure off of your feet when running long distances. However, if you only run in the gym, then a flatter sole and lower heel drop can be more comfortable as it mimics barefoot running. If you are aware of over-pronation or under-pronation when you run, make sure you pick a Nike running shoe with the level of support you need to avoid injury. Under-pronators require more cushioning and stability, so the Nike Lunar Foam would be a great choice for structure and support. Over-pronators will want to avoid that extra cushioning, in which case basic Phylon soles would be a better pick, and those with a neutral arch are lucky enough to be able to pick just about any Nike running shoe. We’ve rounded up a list of some of the best Nike running shoes on the market right now, all of which have different features and cater to all styles and budgets. For added comfort and support when running on any terrain, the Nike Flyknit Lunar 2 is a breathable shoe that is ideal for both the treadmill and the road. The Flyknit mesh weaves looser where less support is needed and tighter where structure around the foot is required. We especially recommend this shoe to those with under-pronation as they have soft but structured foam inner that absorbs impact and supports your movement when running. They come in a choice of neutral colours for both men and women and are a great investment for those who want to take their running more seriously. With speed-laces and integrated reflective elements for enhanced visibility in low light, runners of any level will struggle to find fault with these. Nike has a lot of offerings on the running shoe front but this pair are so well considered and designed that they knock spots off the rest. If you are training for a marathon, you’ll want a shoe that will keep that spring in your step which is why the Nike Air Zoom Vomero 12 are the best Nike running shoes for long-distance. They feature air units in the heel which allow the shoe to respond to your foot’s movement and cushion the impact with every step. The mesh upper keeps your feet cool and the barely-there fit will feel like a dream when pushing to beat your record time. These might be a bit much for a casual jog, but if you are training for a triathlon or any running event, you will notice the difference in spring with these running shoes. These really are a lightweight running shoe. In fact, they are the lightest on our list and the benefits this feature can have to your running technique are huge. Over pronators and those with neutral arches will love the Nike Free RN Flyknit. It provides a barely-there feel that is just like running barefoot and if you often go on short jogs on the road or treadmill, these will provide a natural and comfortable landing with every step. They can come up a little tight, so you may want to go half a size bigger as your feet swell when running, but other than that the only decision to make is which pattern you like best! If you are looking for something particularly stylish, then you can pick what you think makes the best Nike running shoes with the option to customise your own. You’ll get choice of colours as well as an area to add an ID such as race number, name or a quote. Although it gives you this choice, some customers have said the character count is limited, but in terms of functionality the Nike Air Zoom Pegasus 34 is a great shoe for snug support of under pronation and for those with injuries as the ankle cut of this shoe is slightly higher than most for added support and structure. For those on a budget or those who simply want to a pair of Nike running shoes that they can wear during the day, the Nike Revolution 3 is a stylish option. Although they are not the best for serious running, they provide enough support for those with a neutral arch and for casual jogging. They have a wide range of colour options and for the price they are a great bargain gym shoe. The Nike LunarGlide 9 is an ultra-comfy shoe with firm foam soles that are responsive to the way you land when running. This shoe offers a more luxurious feel to some of the others, with softer and smoother detailing, which makes them better for indoors rather than outdoor trails. However, if you’re a casual runner or run mainly indoors on a treadmill, this springy pair will serve you well. These Nike running shoes are also flexible enough to support your feet during other types of movement so are an ideal pick for your next pair of general gym shoes. These Nikes are the best budget running shoes for the gym. The Nike Downshifter 7 is a great alternative if you like the Nike LunarGlide 9 but don’t want to pay the price. They boasts no frills but are the perfect shoe for regular gym use and those with over pronation. The thin layer of mesh means they are very lightweight and breathable so your feet don’t rub when running. Overall, the perfect budget buy for anyone who regularly runs indoors and doesn't want to break the bank. If Nike doesn’t take your fancy, why not take a look at some of the best men’s running shoes for more inspiration.